Come celebrate and pick up 1 of 2 free titles! From her first appearance in All-Star Comics #8 in 1941, the Amazonian Princess has always been a defender of those who cannot defend themselves. With her bulletproof bracelets and Lasso of Truth, she stands up to anyone who threatens that which is good. Finally, after 75 years of comic books, magazine covers, t-shirts, action figures and dolls, she is getting her own movie. 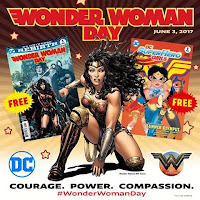 With the DC action flick hitting the screens officially June 2, DC has announced June 3, 2017, as Wonder Woman Day. 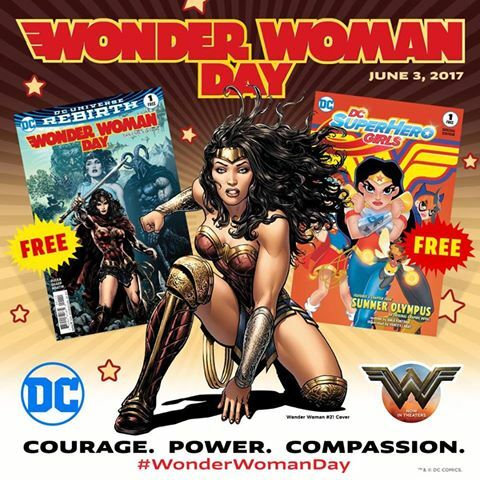 Comic shops around the world will be celebrating in some capacity from costume contests to sales. A Galaxy Called Dallas located in the North Star Crossing Shopping Center will be celebrating as well from 11am until close at 10pm that Saturday. A Galaxy Called Dallas, owned by James Pickering and his seven year old daughter Lillian, will celebrate it's third anniversary in August. Situated behind the CVS at Belt Line Road and North Garland Avenue, the comic book shop will host a trivia contest, raffles, free comic giveaways, tiaras and bracelets to the kids, and take donations for the National Brain Tumor Society, in honor of the owner's late wife, Carroll. We will also have fun activities for the kids! To find out more about the event go to www.AGalaxyCalledDallas.com or search for them on Facebook. You can also call them 972-530-2600 or visit at 1238 Belt Line Rd. #365.